Effective April 2018, the major card brands including Visa, MasterCard, Discover and American Express no longer require a cardholder’s signature for credit or debit card purchases in the U.S. and Canada. This aligns with the world’s shift to digital payments and allows for a faster, more convenient check-out process for you and your customers. Removing the signature requirement does not impact your security or safety as EMV technology and tokenization are superior fraud-protection methods compared to signatures. Visa supports this change for EMV-enabled merchants only. Removing the signature requirement is optional, and you will want to assess your business needs to determine if disabling signature verification works for you. Keep in mind that the signature is no longer required by the credit card companies, and removing this component of the payment process does not adversely impact your security or fraud prevention. Please reach out to your software company. Your software provider will work with our teams to make the required changes and notify you. If you are an ISV partner, please refer to the March 26, 2018 email with the subject line "Say Goodbye to Cardholder Signatures!" for further instruction. Please contact integrationsupport@cardconnect.com to get the process started. If you integrate with the BOLT API and would like to disable the signature requirement, you will need to update your implementation. If you use the desktop tokenizer, you will need to update your cs.ini file. In the file, update the "signature" option to "false". Ensure you are using the the most recent version of the Dynamic Link Library as it has been updated to support disabling the signature requirement. Update the ".getsignature" parameter to "false". If you are a CardPointe Terminal user and if you wish to have the signature prompt removed from your terminals, please contact CardPointe Support to get the process started. Our support team will need to make a few configuration changes to your device(s) to remove the signature prompt. Within the CardPointe Mobile app, tap the menu icon in the top-left corner. 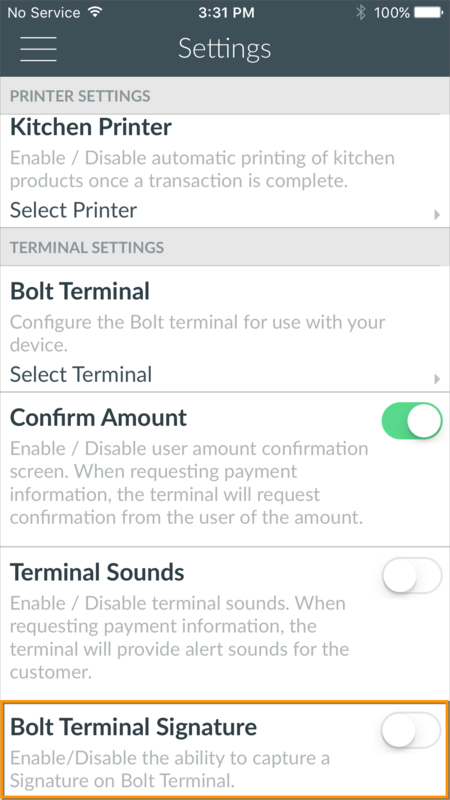 If you process transactions on your Bolt device with the CardPointe Virtual Terminal, please refer to the Configure Bolt Virtual Terminal Settings instructions on this site for details on disabling the signature prompt from within CardPointe.